environment is what led to where you are today with Awen? Is it Nature or Nurture? I feel that AWEN has grown in spite of the fact that we are located in Dallas, Texas - rather than having been informed or nurtured by the urban Texas experience. Due to my interests and style, I was always an outsider and a target in school. I resisted and persisted against the then dominant redneck culture and textbook teachers, and all of those unpleasant early social experiences along with others reinforced my misanthropic tendencies. So, in a way, it did lead me on the path to where I am now. Growing up, my family owned over 100 acres of pasture in Keller, Texas. I spent some time roaming those hills, shooting and thinking at the banks of the stock tanks. The land is now leveled and turned into a sea of uniform houses. You see that ever more frequently in Texas, urban development swallowing the rural. There was only one song we recorded that was particularly Texan in nature, "The Iconoclast", about the slain 'carpetbagger' writer and enemy of Baylor University, William Cowper Brann. He was shot in the back by a Waco Baptist. Yes and no. 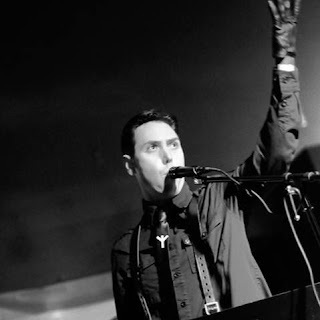 Had I not returned to Texas after briefly pursuing my "dreams" in New York, I would not very likely have had the chance to know Erin, and therefore would have missed my introduction to music of the Neofolk genre and would not have been present for the formation of Awen as a live-performance entity. The fact that our meeting occurred in Dallas, Texas isn't particularly significant though. 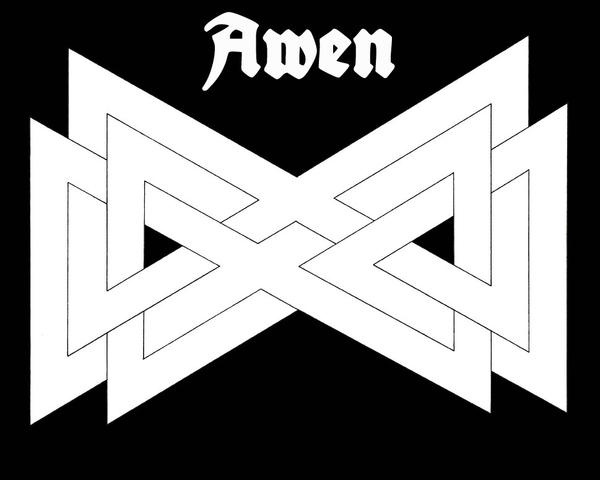 The story of the formation of Awen could be transplanted to any city in any state. It just so happened that we all came together here and not elsewhere. when I was shown the Death In June "Death Of the West" tour and checking you guys out. I was unfortunately unable to make it, but how was playing with Douglas P? It was a fantastic and surreal experience for all of us. We had just performed in Germany a few days previously, and flew from Frankfurt straight to Austin to do the show. Douglas was very kind and inviting backstage, and we spent a good deal of time in conversation over some Texas mead I had brought. When we went on stage, I noticed he was watching from the balcony above for the duration of our set, and said some very kind things afterwards. What an honor! Thankfully the concert was recorded to video by our friend Andrew Zeronine. 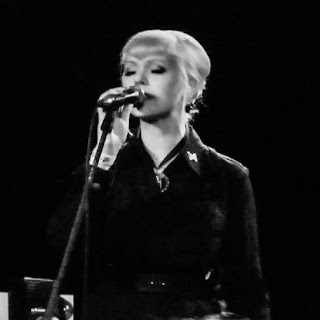 Opening for Death In June was an amazing experience. We had just flown back to the US after a fantastic experience playing with Et Nihil and Sonne Hagal in Frankfurt, Germany, so we were a bit jet lagged. That jet lag soon melted away as we started setting up our equipment and DIJ began their sound check. It was breathtaking to realize we were going to be sharing the stage with two men who have had such a significant influence on so many musicians and so much music (including our own); Douglas P. and John Murphy. Seeing Douglas P. on the balcony across from the stage as we performed was exhilarating and, admittedly, slightly daunting! One of the greatest moments of the evening was at the end of the night when Douglas complimented us on ourperformance; a most supreme compliment! 3. Songs that I love like "Helith's Hill" and "Unter Den Linden" from your previous album Bells Before Dawn gives off a more experimental vibe than your current album Grim King Of the Ghosts with my favorites such as "Grimmigen Grauen Konig" and the title track, which to me, is much more folk-based. Is this a natural progression or will theperhaps be the direction you both want to go? traditional songs which perhaps tipped it a bit more into sylvan territories. process for many of the songs on the new album was rather different from the creation of The Bells Before Dawn. Wes Radvansky, our multi-talented guitar/bass player, and myself were present for almost all recording sessions on the new album. With the first release, I was rarely in the studio and therefore had very little part in song creation, and Wes had not yet become acquainted with us. The group dynamic has changed quite a bit over the years, but ultimately, Erin is the creative, driving force behind Awen's themes and lyrics, therefore, those experimental roots from our first album are still quite present. 4. You two are married. Does this make performing music much more fulfilling? How did you two meet? I think it does. I feel we are lucky to have that extra common bond. Sharing that passion has helped us and the band, in my opinion.I've known people whose romantic partners resented their musical activities, but I could not fathom existing in that situation. We actually met on Hallowe'en at The Church, a local Gothic club night and one of the last big Goth clubs left in the country. We were married at the venue last year! within their relationships. The amount of time and dedication necessary for the creation of music, for rehearsals and for performing often did not leave time to nurture their relationships. Erin and I  were very lucky in that we were always able to do both; nurture the music and nurture the relationship. It has also been invaluable to have Awen as a common interest. Erin and I initially met over eleven years ago through my then acquaintance, now good friend to us both, Per Nilsson. I had seen Erin speaking with Per a few times at the local Goth club, The Church, but did not have the chance to fully engage with Erin until the Halloween event held at the club in 2003. We quickly "clicked" and soon found that we had a shared interest in creating and performing music. been to Houston or Austin? The Kennedy assassination! Musically, Dallas has long been a 'retro' and 'rock' town. I see signs of this changing slowly, thanks in part to the efforts of local promoters like Stefan Gonzales, Oliver Sheppard, and Andrew Haas in Denton (our northern neighbor). They have all done a good job over the past several years promoting things that are beyond the passé staple fare that Dallas was previously resigned to expect. I defer to Erin's answer to this, as I believe he sums it up very nicely! during the writing process of Grim King? As I mentioned earlier, Erin is the director when it comes to the themes and lyrics of Awen's music. He always has several books stashed in different locations throughout the house which he immerses himself in any time he has a free moment. It is from these books that he gleans the majority of his musical inspirations. I must confess, and am rather ashamed to admit, that I have been quite caught up in the online, short-attention-spanned world and currently tend to mostly just read online articles and wikipedia pages. 7. For Erin: You are also part of the supergroup The Muskets. How did this collaborative effort come into fruition and can we expect more material in the future? 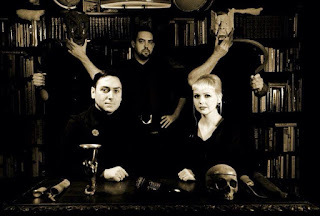 It started from a question that Oliver Sheppard posed to b9 InVid in an interview regarding Neofolk and its historical inspirations, and how that pertains to Americans. What if an American band where to take inspiration from the American Revolution? b9, David E. Williams, Thomas Nöla and I decided to take the concept seriously and formed a band, recording versions of songs from the period in our own modern style - with the help of Andrew King, who contributed reciting excerpts of King George's diary! There has been talk of another album and what that would consist of, but currently there are no solid plans to record. box, I pulled two Type-O Negative tapes, which I also listened to incessantly. Currently, and for many years now, my two favorite artists have been Depeche Mode and Skinny Puppy; Depeche Mode being the only band whose albums I have been able to listen to at great length on repeat and never get sick of. 9. You two are fans of electronic music such as New Wave, EBM, Industrial, Noise, and other derivatives. Could you each name your most influential band in this spectrum and your current favorite contemporary project? performed with Youth Code and have become friends, and we will be performing with Pharmakon next month. Much of the current club music that comes from Rave and Techno culture doesn't really interest me. I suppose it makes sense that Depeche Mode would have to win as most influential on me. As for my favorite contemporary project, I cannot narrow that down to one. Locally, Orgullo Primitivo, Void Prototype and Steelhook Prostheses come to mind. Additionally, I enjoy Et Nihil and Youth Code. Keep a close eye on upcoming Awen shows all over the world. Their latest album along with their music to check out can be found here.